One of last year's most popular posts was entitled Playtesting Success and Mobile Development, which is an apt title for this week too. I'll start with the playtesting. Last week I'd come up with a new version of Zombology on the train to Sheffield and then constructed it last weekend. Games Night was cancelled due to The Daughter being ill again (I'm thinking of suing the nursery ;-) ), but I managed to arrange a playtest session at work on Wednesday lunchtime. 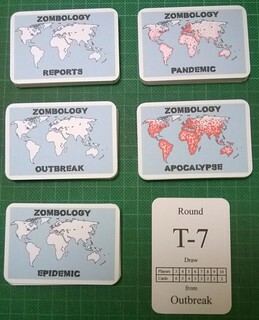 Six us of sat down to play Zombology and because it's very quick we played a couple of games. The games went quite quickly and it was clear that introducing a round track and the events and upgrades had boosted the theme quite a lot (though at the detriment of the science theme, which was much less evident). There was much less confusion about the types of cards too. In related news, I've given up on the artist for the NaGa DeMon winners' copies of Zombology, I'm going to send the the new version as a prize instead - they all seem happy with that. On the app development front, I've started a new app too. Last year I got a Nokia Lumia 920 Windows Phone. As far as I can tell The Wife, Hoops and I are the world's only three Windows Phone owners. There aren't anywhere near as many apps for it as there are for iOS and Android, but I bought it because in the day job I write software in C# and XAML and I could write apps for it in C# and XAML. My job title is technically Project Manager and Software Engineer, and since our takeover by a large American corporation last August it's been leaning more towards Project Management. Coupled with the chronic and acute sleep deprivation my programming skills are fast atrophying, so being able to do some app development in my spare time to keep my hand in has been a good thing. Last year it was an app to help set up and record games of Codename: Vacuum, this year it's an app to try to streamline games of FireFly: The Board Game. While The Wife and The Daughter were away in January I got a chance to play Firefly: The Board Game. I then bought a copy and played it again at Games Night with my chums. I'm a huge fan of the TV series and the game is incredibly thematic, but one of the biggest criticisms I've heard of it is that it goes on too long. My two plays have been 2:20 and 4 hours, which seeing that Games Night only lasts four hours is a bit long for me really. Experienced players say they've got it down to under two hours (like it says on the box), but it'll be a struggle. especially while people are learning the game. One of the clunkiest bits is movement. Each round you have a choice of 'moseying' one space (way too slow!) or going 'full burn' and moving up to five spaces, at a cost. The cost comes via a deck of Nav cards that tell you what happens in each space. So if you want to move five spaces you move a space, flip a card and resolve it, move a space, flip a card and resolve it, five times! Most of these cards are 'Keep Flying' which you can ignore - they have no effect. But just the act of moving then flipping slows you down. 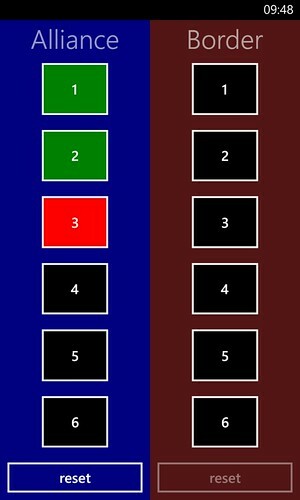 So I've written a little app which I hope will streamline things. It shows Alliance and Border Space as two columns and you just click on the number of spaces you want to move and it will colour the spaces in between green (Keep Flying) or Red (something else). To use it, I'll have to take all of the Keep Flying cards out of the two Nav decks so you can just draw when the space goes red. Last week's blog post was my most popular so far this year, with the most interest on Twitter I've ever had - 5 favourites, 5 retweets and three shout outs - so there's some pressure on this week to keep the quality high! I had hoped to do an analysis of Reiver Games sales over time, but unfortunately I'd failed to copy the relevant files to my new laptop when the old one died, so I can't (at least, not today, I still have them backed up somewhere). So instead, I'll be talking about Zombology again. At last week's Newcastle Playtest I'd played Zombology for the first time since the very beginning of December - it had sat unloved on the shelf for a couple of months awaiting the artwork for the NaGa DeMon winners copies (and my playtest copy of course). We played two games and afterwards I got a couple of pages of suggestions and criticisms from the very thorough discussion. Seeing as I'm pitching this up against games like 6 Nimmt! and No Thanks! this complexity is a major problem, 6 Nimmt! and No Thanks! are both very simple games that you can explain in a few sentences and are easy to pick up, even for non-gamers. Theme is less important in a 10 minute game (I've no idea what the themes of 6 Nimmt! and No Thanks! are, despite loads of plays). I think the zombie-flavoured artwork will go some way to alleviate the lack of theme, but there's more I can and should be doing in that arena. One thing did get positive feedback though, the new scoring was much simpler which was a good thing - everyone was able to calculate their own scores (as opposed to earlier games where I worked it all out for everyone). I've added some upgrade cards and some event cards to tie the theme in tighter (you can now get hazmat suits or suffer a zombie monkey ravaging your lab!) plus I use the round counter to introduce some urgency with decks that are named after how bad it's getting out in the real world. I'm hoping to add some art to the back of the cards which also brings that home. It's a major departure from the last version, but at its core it's still a 10-15 minute game for 3-10 players that features drafting as its core mechanism. I printed it out on Saturday, now I just need to see if it works! It was Newcastle Playtest again on Tuesday, and now Christmas is out of the way it was better attended than it had been for several weeks. We started off with a couple of quick games of Zombology which led to a really useful discussion about ways to improve it. After that I rather selfishly grabbed Paul and Alex and we played Codename: Vacuum too while the other table played a couple of games of Paul von Scott's The Thing with the Ring and then Dan's Samizdat. I'd made some changes to Vacuum since Paul had last played it, changes that were specifically triggered by Paul's last set of feedback so I wanted to see what he made of those changes. All that got me thinking about how as a designer to get the best of out a playtesting session. Depending upon how mature the game you are testing is, the relative importance of those questions varies - finding flaws in the rulebook is very important near the end of the process, but less so at the beginning when you are just testing out a rough idea. Some of these questions you are the best person to answer, but usually it's the opinions of the playtesters that you are trying to gather. Your playtesters are a small sample of the game-playing market that you are exposing your game to in order to try to predict whether your game will be successful or not and to work out what changes are required to make it more successful. Enjoyable means that it's got to be fun for its target market. The market is flooded with tens of thousands of games and hundreds more go up on KickStarter every year. A really successful game has to compete in that crowded market, and win. I own 70-odd games, but only a few of them I've played hundreds of times. Those happen to be really successful games, not just with me and my friends but in the market in general. Because they are fun. Different groups will have different ideas of what makes a game fun, but if no group likes your game then it's going to tank. An engaging game is one that draws you in and keeps you involved throughout. If you look round the table during a game and everyone is either playing games on their phone or staring morosely into their pint that's not engaging. One that keeps your attention throughout is. If you have little downtime between your turns or the ability to get involved on other player's turns then you're more engaged. If the game isn't so random that you can plan ahead for your next move or if the theme and events keep you excited then you're engaged. You're not going to rush out and buy a game if it lasted four hours, and you spent 3 hours and 45 minutes of that playing Angry Birds and praying that the game would just end. Playtesting is your chance to see how your game performs against these yardsticks, get the opinion of people who aren't so close to the game and have the critical distance required to be objective about it and to work out what you need to do to make it perform better. A while ago I heard that Tom Lehmann (designer of Race for the Galaxy) likes to ask two questions during playtests: 'Is there a game in here, and have I found it'. Those questions get to the nub of designing games: Is this going to be a worthwhile addition to the legion of available games - is there any point continuing working on this idea - and how close is it to being finished. Dan, my Newcastle Playtest co-host has his own favourite questions: 'What did you like about the game, and what did you not like'. These allow you to quickly zoom in on which parts of the game are coming along nicely (and should be emulated/left alone) and which parts are potentially putting off gamers (and should be removed/re-designed). Back when I ran Reiver Games I used to ask my playtesters after they had played one of my prototypes whether they would buy it and how much would they pay for it (useful market research when you're a newbie publisher). Now I tend to ask my playtesters to provide some critical feedback via email after they've played my games - the slight disconnect of providing the feedback via email makes it easier for them to be critical without worrying so much about upsetting me and, with my particularly pants memory, having the feedback in electronic form means it's easier for me to revisit it and remember it later. What are your favourite playtesting questions, and how do they help you assess the game? As I mentioned last week, Codename: Vacuum has returned to the fore after a couple of months in the wilderness. I've been making some quite significant changes to a couple of the core decks recently: Trade and Population and I've finally got around to working on a version where the corresponding advanced decks reflect those changes. I started down that road last week, doing the new cards on the computer ready for printing to take to Thursday lunchtime's playtest with Dave. However, now The Daughter is back at nursery the inevitable happened and she came down with a filthy cold complete with fever and sleepless nights (I swear her nursery is actually a secret black lab for testing bioweapons), so printing went out the window. I turned up to Thursday's playtest with the same old version as before, but a bunch of new rules and new versions of cards in my head. Dave, my co-conspirator has played Vacuum probably 70-odd times, he knows it really well. So we just played the new version. I told him what the new cards would do, and we just ignored the cards as printed and played with the new ones. It flagged up a few problems, and along with a new strategy that Dave was trying (using AI to draw lots of cards with his usual very lean deck) it flagged up a few problems - before I'd even printed them out! Having an experienced playtester like Dave was really useful though, testing things out before I had printed them. I've also tweaked the AI card as well now to fix the other problem that Dave found. Sunday night I had time to print it and get it cut out. Or at least I should have been able to do the printing. I'd bought some cheap 'Canon-equivalent' inks on Amazon. They were £18 for 15 cartridges (instead of £12 for one!). I'd already noticed that the ink bled more than the official ink (so the text looks a little blurry) but it turns out they also block up the nozzles more, so I spend Sunday evening running nozzle clean after nozzle clean with the test pages in between and ended up wasting loads of card - each time I thought I'd fixed it the artwork came out green again. In the end I replaced the (brand new!) magenta cartridge with another one, ran a couple more cleaning cycles and eventually got it printed. Now I've just got to cut it all out tonight ready for Newcastle Playtest tomorrow.